The summer season often brings outdoor air pollution alerts, but it turns out the air inside your kitchen can sometimes be just as harmful. Several of the same pollutants found in smog come from cooking dinner. Range hoods are designed to capture these cooking fumes, but even some expensive models aren’t very effective. So researchers at Lawrence Berkeley National Lab are trying to fix that. “I think we think of our home as safe,” said Jennifer Logue, research scientist at Lawrence Berkeley National Lab. In a study of Southern California homes where people cook at least once a week, more than half had air pollution levels worse than the outdoor health limit for nitrogen dioxide, a pollutant that can cause respiratory irritation. Homes with electric stoves aren’t in the clear either, because cooking the food itself creates air pollution. Fats produce a lung irritant called acrolein. Cooking also puts off fine particle pollution, which is tied to long-term health problems, like respiratory and heart issues. It sounds a little scary, but Logue says there’s a solution: a good range hood that vents to the outside. 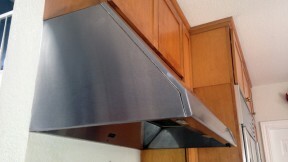 The only problem is that finding a good range hood isn’t simple. “Not all hoods work the same and currently, unfortunately, there’s no way for people to really know how effective their range hood is,” Logue said. 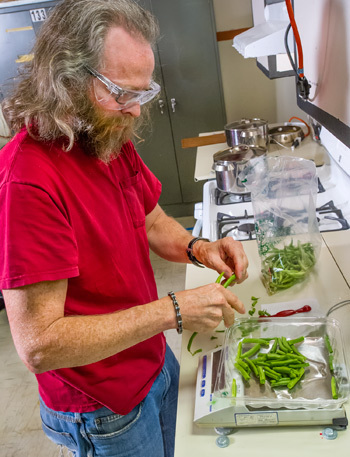 Inside Berkeley Lab’s test kitchen, Woody Delp and his team make a recipe they’ve made a hundred times exactly the same way: stir-fried green beans. The lab’s gas stove has a hood that’s rigged with air monitors. As the green beans sizzle away, particle counters around the room start to spike. Based on their testing, the hood is in the middle of the pack. Delp found hoods that were only 15 percent effective at capturing cooking emissions. Others did much better, but they weren’t necessarily the most expensive ones. And specific information about how well the hoods capture cooking emissions is not available to consumers. “If you go down to your local big box retailer, they’ll have what the air flow rate is and maybe a sound rating on it,” Delp said. Air flow – or how powerful the fan is - is only part of the puzzle. The shape of the hood and how far it extends over a stovetop makes a big difference. Delp and his team are developing a standardized test to measure hood effectiveness, which is currently being reviewed by an international testing board. Delp says a lot of manufacturers are interested in using it. “Unfortunately there’s not really a state or federal agency that has comprehensive authority over indoor air pollution,” said Peggy Jenkins, who manages the indoor air quality program at the California Air Resources Board. California has strict ventilation rules for other gas appliances in homes, including furnaces and hot water heaters. Stoves and range hoods have been largely overlooked. “In a sense it’s low-hanging fruit but it’s not really simple,” Jenkins said. Regulatory efforts would require a number of state agencies to get involved. But Jenkins says there’s growing interest in changing the state’s building codes for range hoods. That could mean adding new requirements for the air flow or the hood’s shape, since those vary quite a bit. Use the highest fan setting and put pots and pans on the back burners, where hoods capture the most pollutants. They’re simple changes but effective ones, Logue says. The hard part is remembering them.